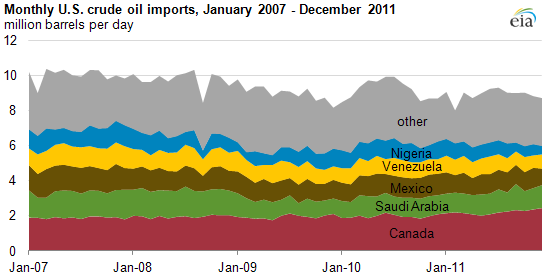 Source: U.S. Energy Information Administration, U.S. Imports by Country of Origin. The amount of crude oil the United States imported from its top five foreign suppliers—Canada, Saudi Arabia, Mexico, Venezuela, and Nigeria—increased slightly during 2011, even though total U.S. crude oil imports fell to their lowest level in 12 years. As a result, the crude oil from these five countries accounted for a bigger share of overall U.S. crude oil imports, nearly 69%, or just over 6.1 million barrels per day (bbl/d). Canada, Saudi Arabia, Mexico, Venezuela, and Nigeria have consistently been America's five largest crude oil suppliers, although their rankings varied from year to year. However, U.S. purchases of crude oil in 2011 increased from Canada and Saudi Arabia and declined from Mexico, Venezuela, and Nigeria, according to final trade data from EIA's February 2012 Company Level Imports report. Combined crude oil imports from the five countries increased by less than 1% during 2011 to 6.1 million bbl/d. At the same time, total U.S. imports fell about 3%, or 0.3 million bbl/d, to 8.9 million bbl/d. That marked the lowest annual level of crude oil imports for the United States since 1999. The combination of lower total U.S. crude oil imports and higher crude oil shipments from the top five foreign suppliers boosted their market share to about 69% of all U.S. crude oil imports during 2011, compared to 66% in 2010. Canada. Crude oil imports averaged a record 2.2 million bbl/d, up 12% from the year before, and topped 2 million bbl/d for the first time because more oil is now being transported by rail. Saudi Arabia. Crude oil imports averaged 1.2 million bbl/d, up 10% from the year before, and were the highest level since 2008. Mexico. Crude oil imports of 1.1 million bbl/d were down 4.5% from the year before and the second lowest since 1995, reflecting the steady decline in Mexico's crude oil production and rising domestic fuel demand. Venezuela. Crude oil imports of 0.9 million bbl/d were down 5% from the year before and the lowest since 1992. Nigeria. Crude oil imports of 0.8 million bbl/d were down 22% from the year before and the lowest since 2002, due in part to civilian unrest that disrupted the country's crude oil production.